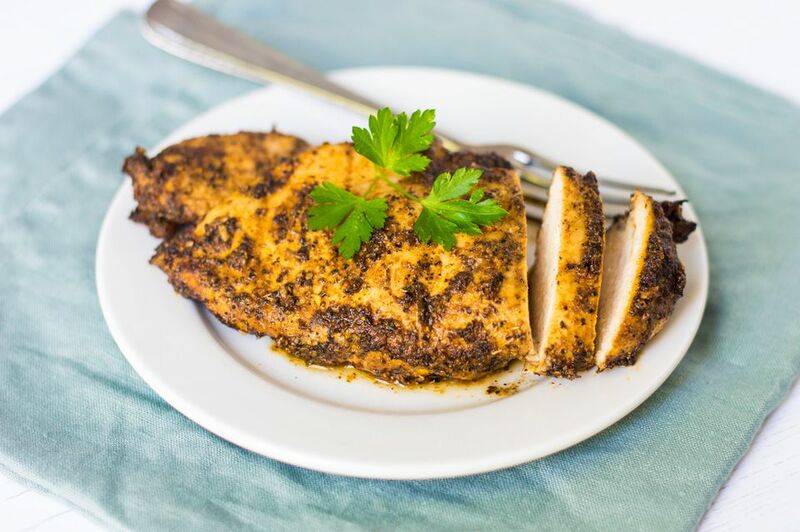 This easy chicken recipe is made with Cajun spices, boneless chicken breasts, and a little vegetable oil. It's a light and easy entree and takes less than 25 minutes to prepare and cook. The chicken is seasoned and refrigerated for about an hour before it's cooked, so plan to begin at least an hour before you plan to cook the chicken. Serve the chicken with mashed potatoes or roasted cauliflower along with steamed peas, broccoli, or green beans. Or slice the cooked chicken into thin strips and serve them atop a fresh tossed green salad or spring greens. See the variations for a homemade Cajun seasoning blend and instructions for using it in the recipe. If the chicken breasts are large, slice them horizontally to form thin cutlets. For faster cooking, place the chicken breasts or cutlets between sheets of plastic wrap and pound to flatten to a uniform thickness. Combine the seasonings and oil to form a paste, adding more oil if needed. Rub the seasoning mixture all over the chicken breasts. Place the seasoned chicken breasts in a food storage bag and refrigerate for at least 1 hour. Grill or broil the chicken for about 5 to 7 minutes on each side, depending on thickness. Chicken is done when juices run clear when pricked with a fork. *A serving of chicken is about the size of a deck of playing cards, or about 3 to 4 ounces. Unless chicken breasts are sliced to "portion size," they might weigh as much as 10 to 12 ounces. Homemade Cajun Seasoning (unsalted): In a small bowl, combine 2 teaspoons of onion powder, 2 teaspoons of paprika, 1 1/2 teaspoons of garlic powder, 1/2 teaspoon of dried leaf thyme, 1/4 teaspoon of dried leaf oregano, 1/4 teaspoon of chili powder, 1/4 teaspoon ground black pepper, and a dash of cayenne pepper. Use this mixture along with 1/2 teaspoon of salt and omit the pepper, onion powder, and garlic powder in the recipe.